Do you use your content to the fullest? Have you fully explored all the options you have for using your book for income and impact? In this training, Matt Tommey shares with us how repurposing helped him launch a book and an e-course. 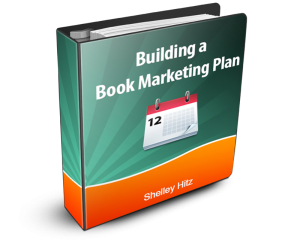 Plus, he shares other book marketing tips that he has had success with. 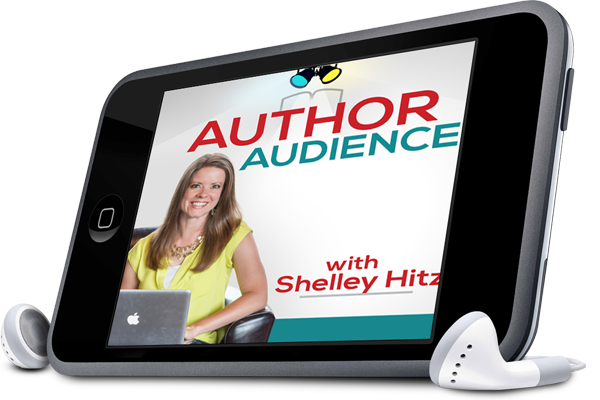 Shelley: Today I’m rolling out the red carpet and inviting you to join me in this expert interview with Matt Tommey. Welcome, Matt. Matt: Thank you so much, Shelley. Shelley: So, today I’m hosting Matt Tommey, let me just tell you a little bit about him. I’ve actually been in his online mentoring program for about a year and a half now. I’ve spoken at his conference Gathering Up Artisans, went to his Mastermind and had really just got to know him. Matt’s the real deal. He’s a sculptural basketry artist, say that ten times fast in a row. Matt: Exactly, total tongue twister, right? He’s from Ashville North Carolina, an internationally known motivational speaker, and all of you will be excited to know that he’s an author of four books. That’s awesome. His passion is helping artists, which includes writers, learn to thrive spiritually, creatively, and financially so that they can live the life they were divinely designed to live. In 2018 Matt was recognized by Professional Artist’s Magazine as one of the best artist mentors in the country, and you can check him out at his website www.MattTommeyMentoring.com. So, welcome Matt! And I’m so excited for you to share a little bit about your own success. Matt: Absolutely. It’s funny, I don’t often get introduced as an author because I’m with visual artists mostly. I never intended to be an author but it just kind of happened. So, this is funny that I’m being interviewed on an author’s podcast, you know? Shelley: Yes, and it’s awesome, because your books have impacted so many people, and God’s used them in so many ways. 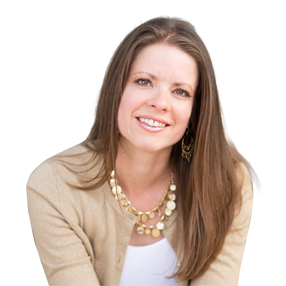 Today I want you to talk a little bit about your most recent book, “Created to Thrive”. I’ve read that book, I also took the e-course you did with that, and it’s just a really impactful book for me and I know, to many artists and writers as well. I just want you to talk a little bit about the process that went into this book and content, then how you even repurposed the content into other things, and how that worked for you. Matt: So, “Created to Thrive” is kind of the next step in my journey. I always try to write out of and teach out of the things that are going on in my life now. My first book was “Unlocking the Heart of the Artist”, which was this kind of me coming out of all the stinkin’ thinkin’ I’d had for years, a lot of woundedness and trauma, that sort of thing. And it’s also kind of aligning with who God had made me to be. “Created to Thrive” is really the next iteration in that and really was about the strategies and tools that I’d realized in my own life, and also in the lives of the artists, I was mentoring in the Created to Thrive mentoring program. So, it’s kind of a compilation, I guess, of a lot of different things, which is typically how I’ve written books in the past. I never set out be an author, per se, I didn’t really know how you were supposed to do it. So, in all my books, I took disparate messages I had either spoken at conferences, blogs, and things like that and tied them together with my own personal story. So, “Created to Thrive” is really the fruit of that. It focuses on renewing your mind, what’s possible, how your brain works, and practical ways to see change happen in your life. So, I love it; it even has some practical tips at the end for what artists can do right now to start thriving in their lives and their own art business. Shelley: Yeah, and I love that. I think those of you listening, you know I talk a lot about repurposing, and Matt just talked about that. I’ve done that too. I’ve taken presentations that I’ve given that were well received and turn it into books; the slides become the outline. 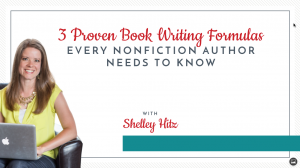 Blog posts, you can blog a book. So, look at what content you already have and see what you can repurpose. Talk a little bit about how you did the audiobook. 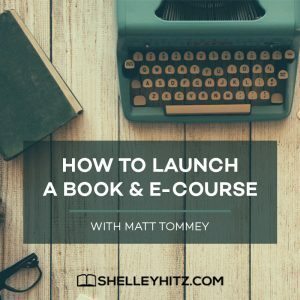 You did the eBook, and you did the print book, but talk a little bit about the e-course and the workbook you did with this as well. Matt: Yes, so this was kind of the biggest thing I’d ever done. When I did Unlocking, this was in 2011, I didn’t know anybody doing e-courses or that kind of stuff in my world. So, we did a thing and it was great. But I knew that I wanted to do that this time because I was seeing the power of community in the mentoring program. I really needed it – a lasting change happens in people’s lives in the context of community. Doing the “Experienced Course”, we called it, with a workbook and all that was a really powerful way to take the things I was writing about in Created to Thrive. Then, I flesh it out with activation ideas, journaling opportunities, art projects, and things like that. But I kept having people ask me for the audio version, which is hilarious to me because when I hear myself talk, I’m like, “Are you kidding me? I sound like a country bumpkin”. People wanted me to. I feel like Gomer Pyle sometimes, “Hey ya’ll!” People really wanted my voice on there. I think that’s been one of the biggest things that I’ve heard over the years. People have read my books, and they said when they read my books that they can hear me saying it. So, the audio version now, “Created to Thrive”, that’s really helped to build a really deep connection with people. They’ll throw it in when they’re working out, riding in a car, on a plane, or whatever. It’s another way for that information to get in. Again, you’re taking a book that you wrote, and I turned it into the E-course, the workbook, and the audio version. Then, with the e-course, the Experienced Course, we did, I think it was, 7 or 9 videos, that was for each week, it was a 7 or 8-week course. I did a little teaching video of about 15 minutes for each one of those that corresponded to the workbook. Again, this is going a little deeper than I did into the book leading into the exercises in the context of the workbook. I’m a big believer in batching everything, and so we recorded all those at one time here in the studio, and it was great. I think more than anything I’ve done so far; it has been a really great tool to bring people into the power of what the book talks about. Not just in a mental kind of only your brain way, but really in a tangible way through all the art exercises, journaling, and all that. I loved it. Shelley: I was part of it, and so I thought it was just a great idea, just such a great idea, I might have to steal it at some point. Matt: Well, none of us are original. I think that’s the thing about community – we all stand on each other’s shoulders. Even right before, when we were sharing and just kind of visiting before the podcast, you’re doing things that I’m not doing, I’m doing things you’re not doing, and none of us can do everything. So, I think having that teachable spirit, for all of us, is so important to really do the fullness of what we’ve been designed to do. Shelley: Yeah, and like I said, success leaves clues! So, you charged a higher price point for the e-course, so it was an income generator. Then, also, I loved the workbook. There is so much research about how powerful it is to write things out. I have to admit, at first, I thought the art things were kind of like projects because I’m a practical entrepreneur and I’m just getting into the art stuff, but they were powerful when I did it. I went through, and now I’m selling some of those things that I created. So, anyway, it was just a really powerful experience, but then I also watched as you marketed this and I think, if I remember correctly, you started with a 30-day art challenge leading up to your book launch, is that correct? Matt: I did, and that was just a wonderful way to kind of heighten everybody’s awareness. I think in Facebook land and Social Media land there is so much great stuff going on all the time. So as an entrepreneur, you can kind of raise your flag from time to time. You can’t do it every day, but there are seasons, two or three times that we’ll do that. I’ll raise a flag and go, “Hey! Pay attention! We’re all going to do this together.” Then, I use that, sort of, as a runway, now that I have people’s attention and I’m building relationships with them, to talk about what my next opportunity is. Shelley: Yeah, and I’ve done challenges a lot. The writing week challenge and different things. It’s powerful when you can do it live like that, together in a group. One thing that I’ve noticed you did, and I do as well, is you did a couple live videos throughout the time as well. So people are seeing your face, and getting to know you; know, like, and trust – all that important stuff. So, you did the 30-day art challenge, and that was a huge success, then talk a little bit about some of the other things you did to market your book. Matt: That was a huge part of it. I don’t know, I’m thinking on that one we took in between 2-3,000 new members in our free Facebook group, the kind of public Facebook group. Matt: So that was just incredible. Then, with that, with the art challenge, I always do a guide for that. So, if you want the guide, you can download it from our website. That allows people to get on our email list, which then allows me to contact them in the context of the offer I’m going to be making later on. So, again, it’s just that you’re trying, in the best way you can, to connect with people and let them know what’s going on. As wonderful as Facebook is, I think something has to be communicated outside of Facebook. So email is a much better way to communicate with people about an offer, a launch that you’re doing, an e-course, or something like that. So, I want to use Facebook for what it’s great at, but I also want to bring people over to my email list. I use it so I can begin to build a relationship with them, not only during the launch but also afterward, for my podcast, other articles, maybe other books, or an opportunity to join the mentorship program. The email list becomes my go-to place for that, whereas Facebook is more about building a relationship. Shelley: Yeah, and that’s super smart. I always tell people, even if you have a free Facebook Group, have them sign up for an email list to get access. Or you can have them download some sort of worksheet, eBook, or something that goes along with it because that’s long-term relationships. We miss things a lot on Facebook; you don’t see everything. Email marketing is definitely not dead, and it’s been one of the biggest ways that I’ve sold books and been able to follow up with people who want to hear from me. So, that was huge. So, you did the art challenge, you built a Facebook group of several thousand people and you also built your email list at the same time. Those things really continue to work for you, and you continue to follow up with people from that. Now, I also saw during the process that you also decided to do a free KDP promotion, so talk a little bit about that. Matt: I was scared to death. Shelley: Was it your first one? So, we gave away, gosh, I think over 5,000 books in 3 days, Kindle version. The thing I kept remembering in my book, the beautiful thing about Amazon is you get this huge audience. The bad thing about it is you have no way to contact any of them. 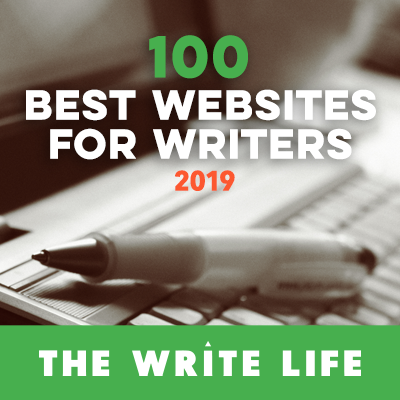 The thing that we’ve done in all my books is that, as you’re reading, I continue to offer you opportunities to get a free resource, and to connect with me online, that sort of thing. So, throughout Created to Thrive, I knew people were going to have that opportunity. The other thing I found really interesting was book sales during the freebie giveaway spiked, in a huge way. We went to number 1 in all these categories, and it was just really amazing to see how that worked. So, I sold a ton more than I thought I would, just by giving away the Kindle version. This is because lots of people, even though they want the Kindle version, they want that print version as well. So, it was amazing for me, first one I’d ever done, and I’d definitely do it again. Shelley: Yeah, and for you, it makes sense, because you have other products. I am always talking to authors, “create other streams of income, create other products based upon the content, small courses or different things.” You have your mentoring program, which is a recurring income, but then you also have your e-course, other things, and possibly more things coming down the line. Matt: Well, there’s always something coming when you’re an entrepreneur right? Shelley: I know! So, you were able then to also market and share about your mentoring program though, too, right? Matt: Yeah, that was a wonderful opportunity. I’m always trying to connect people to a community because I believe that’s where real growth and lasting change happen for people. The fruit that I’ve seen in people’s lives through that has just been absolutely incredible. There’s something really special when you create a community like that. People feel safe to share and get feedback, and all that. We’re on a podcast and talking a little bit about these things, so share a little bit about your podcast that you have. Shelley: Never say never, right? Matt: I’m a marketing guy professionally, and I’m a branding guy. So I just could not figure out what is the purpose of this podcast? How am I going to fit this into my schedule? And all that. So, I have to admit, I pushed it down on my to-do list for a lot of years. But I developed a team to really run the mentoring program, and we have over 900 people on that now and there’s no way I could do that by myself. So the team really freed up more time for me to develop the podcast, which is called The Thriving Christian Artist. There are so many great podcasts out there, yours included, and I wanted to make mine a little different. A lot of people that interview artists are always interviewing the superstars and I really wanted there to be a voice for emerging artists, for people that are in the trenches, and that are going through the growth pains. I want those, “I was here, I’m here now, and here’s how I did it,” kinds of stories. I love that, I really try to be, and it’s not a marketing shtick, I really kind of am the everyman. I did not know that I could be an artist, I did not think ever that I would be doing what I am doing now. God completely changed my life and revolutionized my art, and I’ve tried to share that with others. As I tell those stories of other artists that are having that same experience, it’s really transformative and inspiring. So, that’s what I try to do on the podcast. Shelley: Yeah. So, I encourage you. I know it sounds like it’s for artists, which a lot of people think visual artists, but artists include writers. 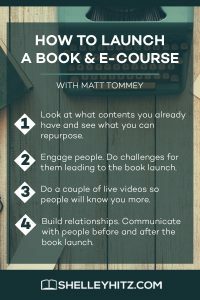 So, definitely check out Matt’s podcast as well, and check out his website and all the resources he has at www.MattTommeyMentoring.com. As we kind of come to a close today, you’ve shared a ton of really great information and stuff you’ve personally done and succeeded with. What would be a take action tip you would give our listeners today? Matt: I think, especially for somebody that’s writing a book, since so many of your listeners are authors, begin to look at ways that you can repurpose what you’re doing. An e-course, even though that seems like, “oh my gosh, that’s so huge!” It’s really not. 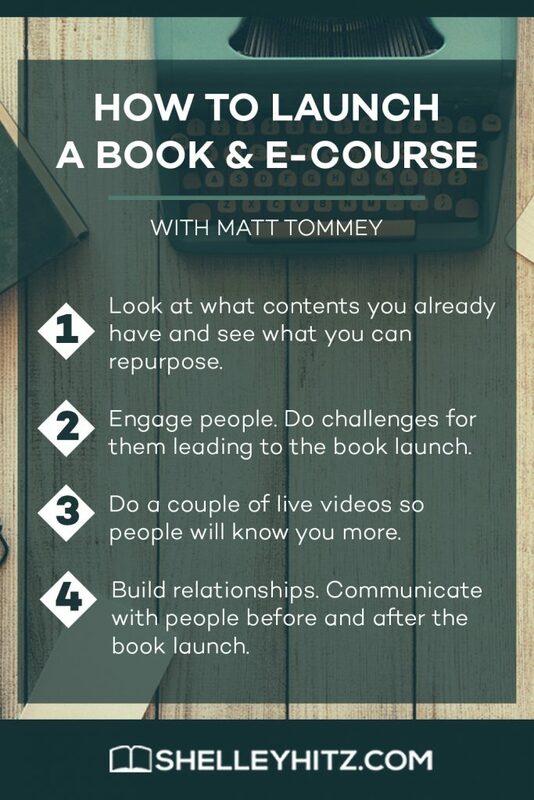 I think what holds people back in thinking about doing an e-course for a book that they’ve written is all the technology. Nowadays it’s so easy to really record some cool things, even with a nice iPhone or whatever, and a good Blue Yeti mike or whatever. I think people nowadays; I came into this really thinking that there had to be this huge level of TV likea production of things. I just realized that is not true. You can start where you are with the context and content that you have and get out there in the water. Many people wait until everything is perfect, just get out there and do one. If you screw it up or do it in a way where you think, “I’ll do it better next time,” then do it better next time! But at least you got one under your belt, and you’re going for it. Shelley: Yes. I just want to say, “Preach it!” It’s so true! Right now, we’re recording on Zoom, so anyone can sign up for a free Zoom account for up to like 40 minutes or something. You could just use your webcam, I have my webcam in my MacBook Pro, I have a Blue Yeti mike here, and you can just record your videos for your e-course. You can do screen share on zoom, you can do talking head, and it’s free. You can do this, it’s like 15 minutes per week, or whatever. So, I love that, and I’d love to see all of you just brainstorm ideas of what you can do for an upsell, an e-course, to help people apply the information even deeper and really change their life and transform their life. Thank you so much for being here today Matt, it’s such a privilege to have you on the show. Matt: I’ve enjoyed it so much. Shelley: Thank you all for listening, I hope you were inspired. Share this podcast to someone that you know. Until next time!